I hope it's been lovely so far. Just lovely. 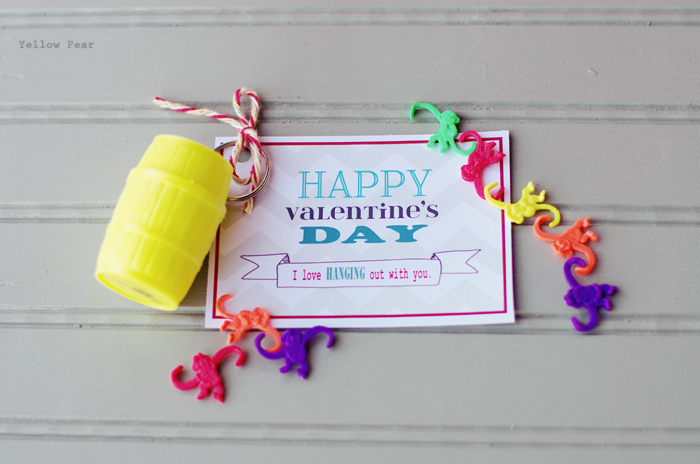 I look forward to Valentine's Day every year and really get a kick out of making cards for the kids (I've said it before). I like them to be fairly cheap, unique, and fun for the individual child to give out. And (as I told my sister) it's the one chance a year to be cheesy...extra cheesy. Which is so fun. 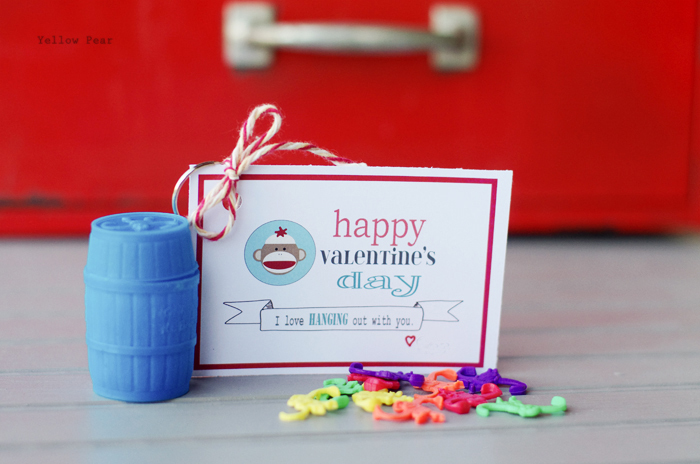 I spotted mini barrels of monkeys at Party City awhile back, and about died. 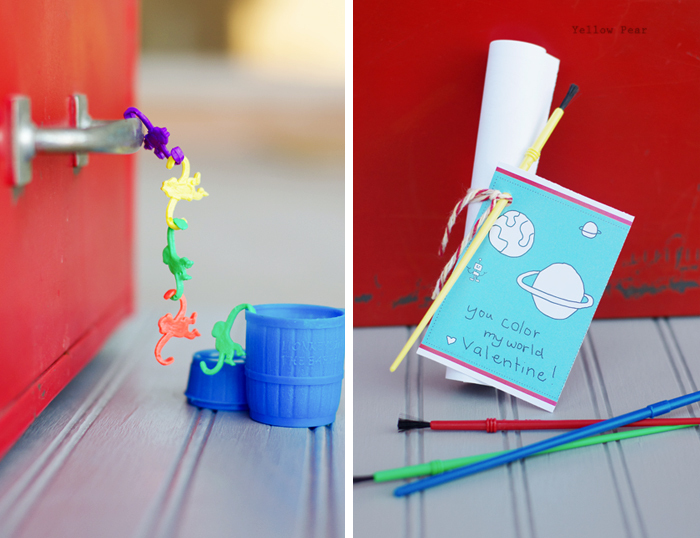 I knew I had to do something with them for Q. Miniature barrels with the teeniest mini monkeys in rainbow colors. What could be more cute?! 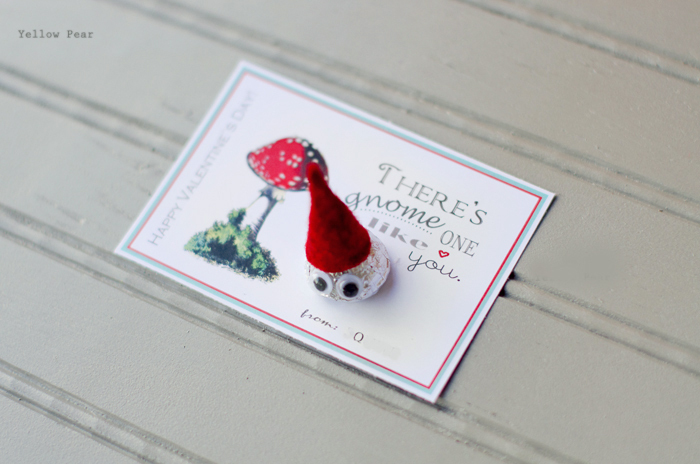 He only had a handful of friends he was going to give them to, so I bought the few I needed and made an appropriate card. Then. 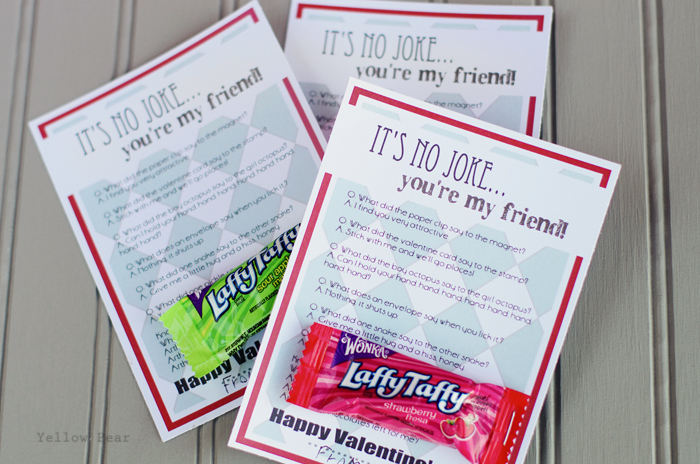 A few days before Valentine's Day...a group of ladies organized a get-together for a bunch of the preschool aged children that didn't really have a venue to exchange cards. And it suddenly hit me that 1. I needed more cards and 2. I would be passing out choking hazards. So. I quickly scrapped the monkey idea and set out looking for another one. 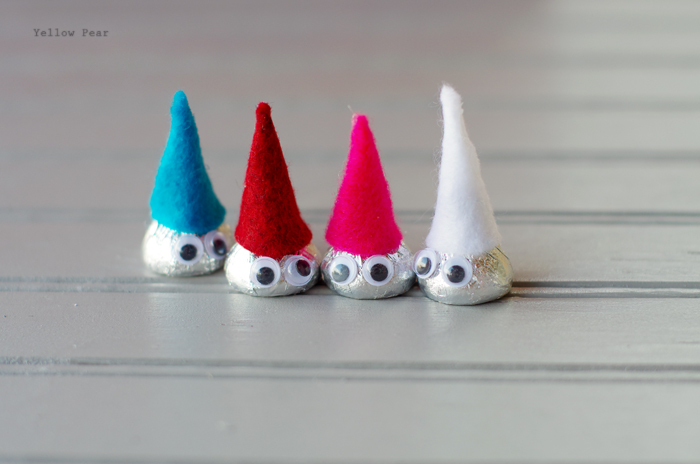 Miss B saw gnomes made out of Hershey's kisses in our Family Fun book and fell in love and said we should make them instead. 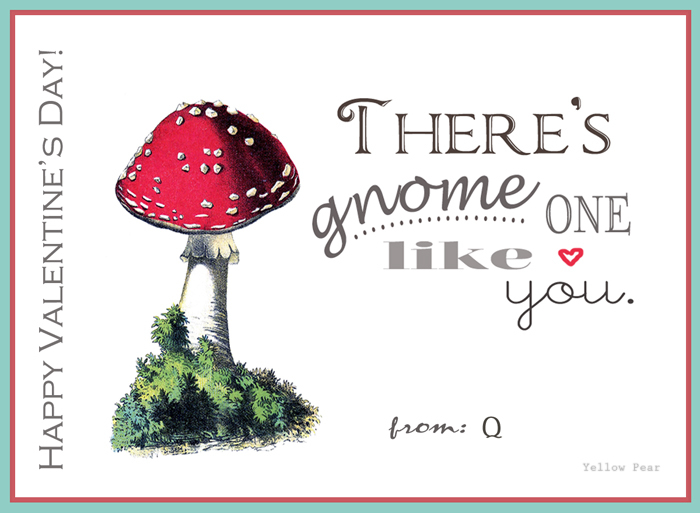 I thought of a delightfully cheesy saying and quickly made a matching card. We finished them up last night and I think I might like them even more than the monkeys. Mr. C came up with his idea all on his own. I thought the joke idea was perfect for his age...and it's not too girly or mushy at all. Plus he loves jokes. Loves. He can read a joke book for hours, giggling to himself...and us. Miss B loved the mini monkeys and wanted to give them to several of her close friends...until we made the gnomes and then she gave them gnomes too. Dennis really wanted something with robots this year. I ran through a plethora of different ideas and then finally found a pad of coloring pages complete with a paint palette at Michaels. They were robot-themed and were only $1 for 12 pages. 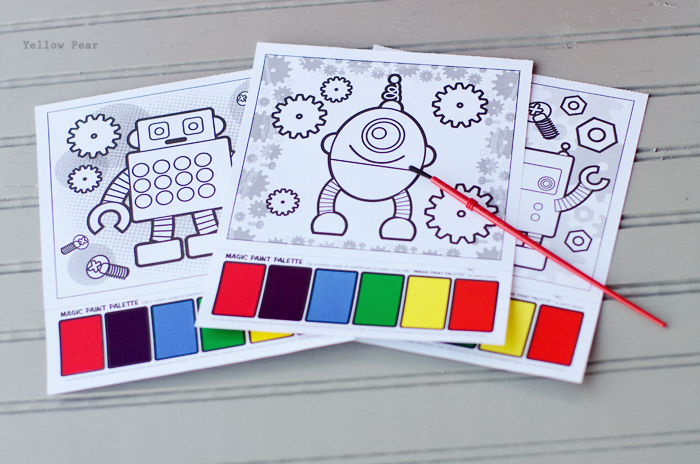 So we rolled up a page, added a color-able robot card and a paint brush... and tied it all together. Dennis meticulously wrote his name on each card and carefully threaded a paintbrush through every bundle. Also, I had fun taking pictures of mini monkeys. You're going to have to send me an "advance", covert/clandestine email for next year. I could really use these ideas in ADVANCE, Lou! Fat lot of good they do me now! ;~) You're amazing, though. :~D Happy Valentine's Day! who are you? Super Woman? Where is your cape? It's an invisible cape isn't it? I knew it! Could you let me know where I could pick up one of those super woman invisible capes? You always do the cutest things! 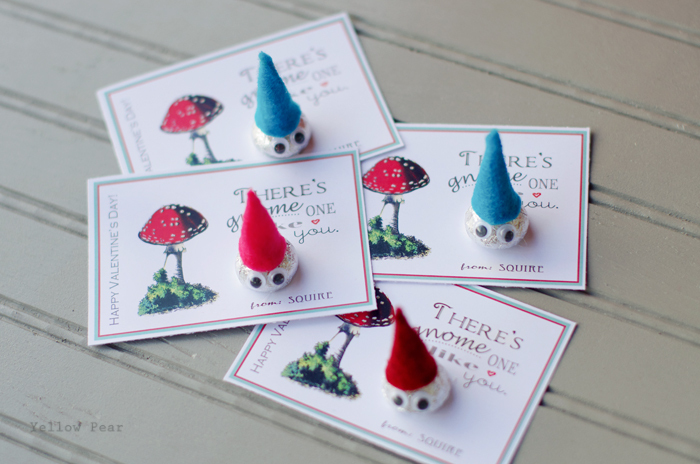 I LOVE the gnome one!!! But they're all so cute!